Ah, I have my computer back! You know what that means: you are in for another unmercifully lengthy account of trekking, with photos. Just to start you off, the first part of this trek is here. 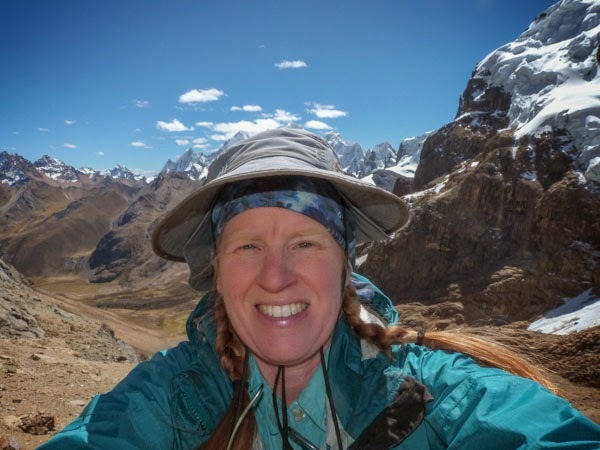 Go ahead and read it, or even better, use the "Photos and Travel" page link above to see the other posts on our trip to Peru. Go ahead. I'll wait. 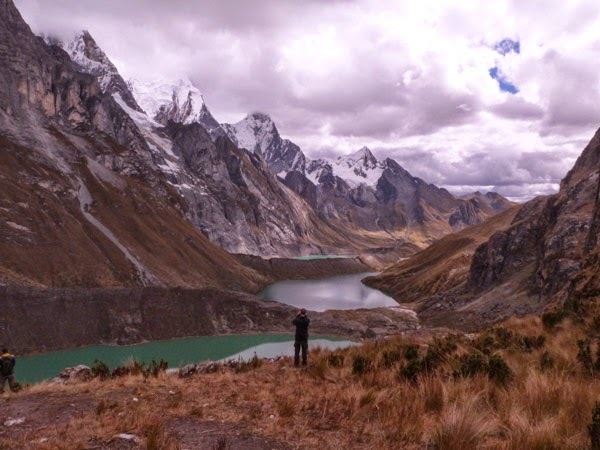 My previous Peru post ended somewhat abruptly at the evening of the 3rd day, mostly because my computer crashed. So we resume our trek on the morning of the 4th day. We woke to clear skies and cold temperatures, and began hiking early enough to enjoy the still air. Lake Carhuacocha enjoying the morning calm. As usual, the clouds gathered around the mountains early, but never completely obscured them. We hiked up to the head of the lake, feeling very close to the mountains. Just to give it the perfect Lord the Rings feel, there were horses grazing in that meadow at the head of the lake. Climbing ever higher (and higher, and higher. . .) we passed a series of three beautiful emerald glacial lakes. The third, barely visible in the distance, had hunks of ice floating on it, and as we climbed away from it we were treated to a demonstration of why, or how. A modest section of snow and ice fell from the glacier above, streaming down the cliff in a temporary waterfall (snowfall? ), and crashing into the lake. We were sorry to be too far away to see what kind of wave it made, or how much of an iceberg, as even across the valley the roar was impressive. Lakes Quesillococha, Siula, and Gangrajanca nestled below Nev. Yerupaja and Yerupaja Chico (Siula Grande is out of sight to the left). The icefall was into the farthest, barely-visible lake. 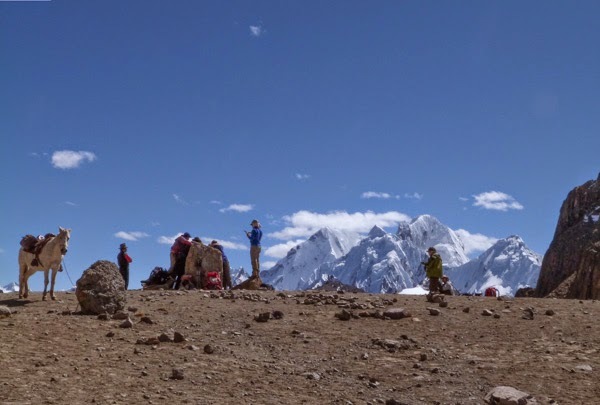 As always, especially when we've climbed a steep and rugged 16,000' pass (Siula Punta) and then descended 1600 foot-pounding feet, we were glad to see our camp in the distance, though there were some moans about just how distant it appeared to be. 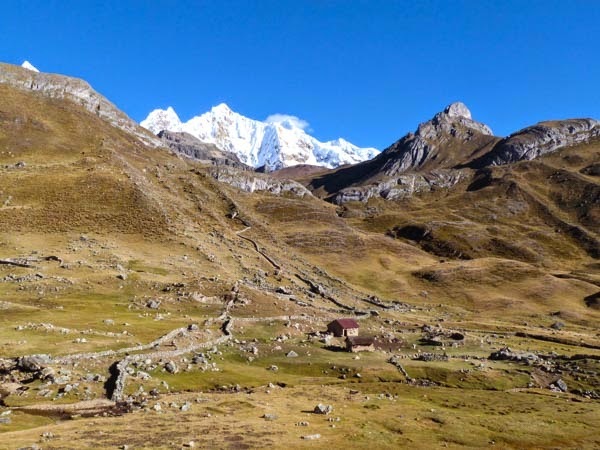 We could also see the next day's (mercifully short and easy) climb ahead, a longish but mild ascent to Portachuelo de Huayhuash. 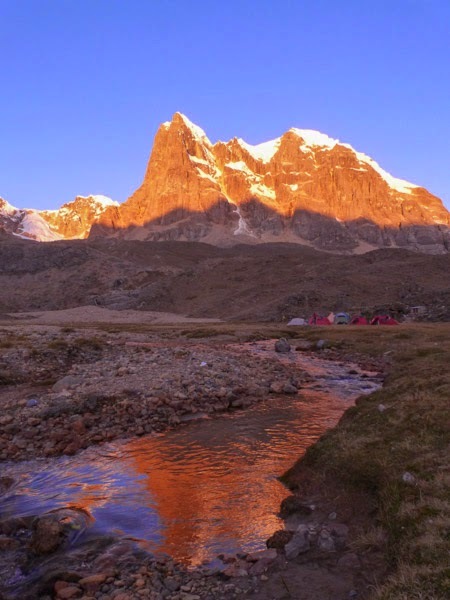 Huayhuash camp. Ours was the one in the background, barely visible as red and yellow specks beyond the stone corrals. Next morning, as we climbed from our camp, we could see the mountains that had been just hidden from us. 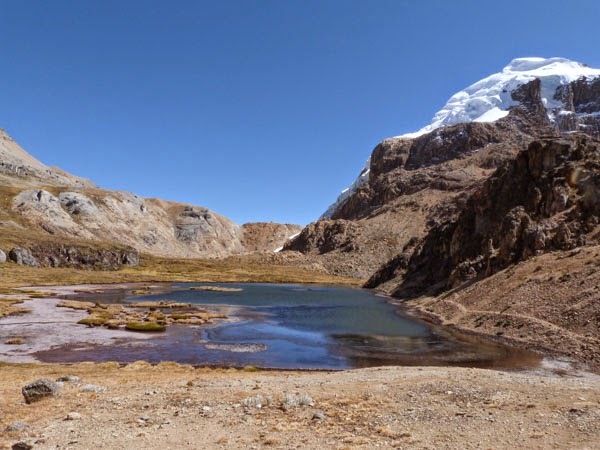 When we crossed the Portachuelo de Huayhaush, we also crossed back out of the Amazon drainage to waters that flow to the Pacific. (We crossed the divide with our first pass way back, and had been traveling down the east side of the range, crossing the headwaters of the Amazon River). It was an easy climb, made more challenging for me by a touch of, um, internal distress. I notice a dearth of photos (comparatively speaking) from that day's hike. 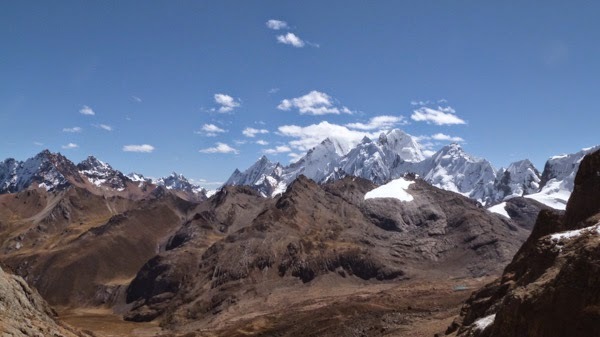 Looking over Huayhuash to the Nevadas Jurau. Our fifth camp provided us with a great treat--short on spectacular scenery, it more than compensated by having a hot springs! We didn't expect much, but it was in fact the perfect hot tub temperature, and our tired muscles appreciated it no end (I also appreciated a chance to at least thoroughly rinse my hair, as even I have a limited ability to immerse my head in glacial meltwater). Steam rises from the pool in the early morning chill. 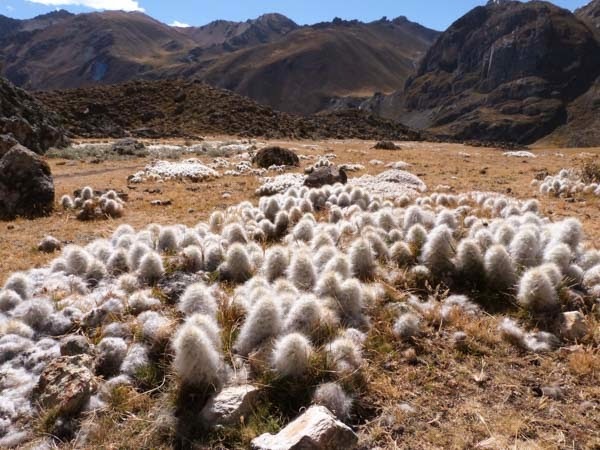 The sixth day had us back to serious climbing, headed for Punta Cuyoc, the highest pass on our main route. Approaching Punta Cuyoc (at 4950 meters--16,330'--the highest pass on our main route). Now we're looking at the west side of the range again. Atop Punta Cuyoc, looking at Sarapo, Siula Grande, etc. I just had to get a little higher--I was thinking of trying for 17,000', but the climb was a bit farther and steeper than I wanted. The whole range from above the pass. But I did take the obligatory selfie! Note the amount of clothing I'm wearing. Though it was sunny, it was windy and not that warm. I shed layers when climbing, but had to put them on as soon as I stopped. I took this photo somewhere around 16,400'. Self-portrait at my high point--which I thought would be it, but in fact was topped the next day. 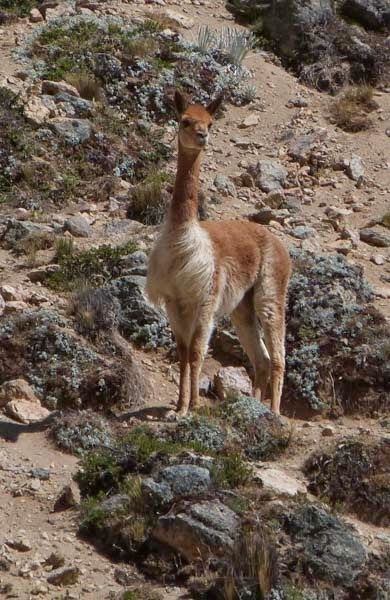 On the way down the pass, Second Son startled a vicuña off of the trail, and we were all able to spend some time admiring this wild ancestor of the alpaca. That evening, she (or another) could be seen happily grazing with our burros. Keeping a close eye on the two-legged visitors. We never learned the name of these lovely and cuddly-looking plants, so if you know, drop me a note. Of course, since they are some kind of cactus, we did NOT give them the hugs they seemed to demand! Not as huggable as they look! 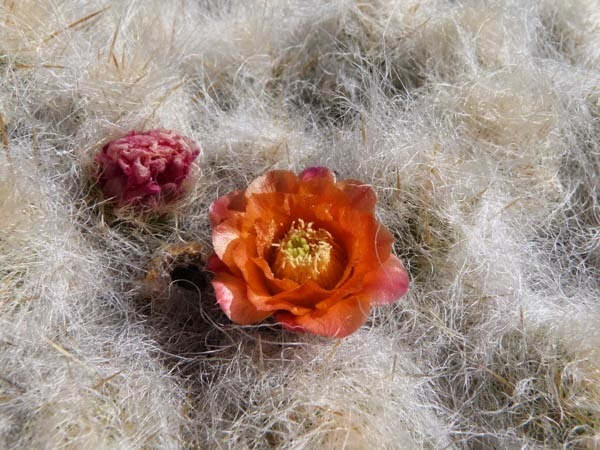 Most places the cacti were just fuzz-balls, but in this spot below Nev. Cuyoc, they were in bloom. 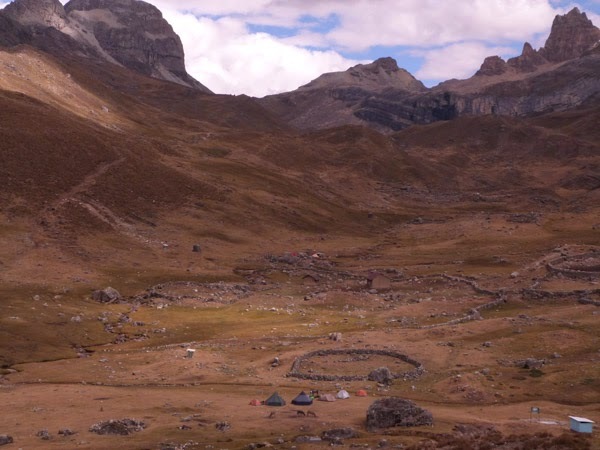 And our sixth camp, not far below 15,000' in a meadow at the base of Nev. Cuyoc. Rainstorms apparently over, we got some beautiful light as the sun went down, but no spectacular sunset clouds. Camp 6, just under 15,000' at the base of Nev. Cuyoc. I'll finish the trek next week! The farther I go with these, the harder it is to pick which photos to share. I've been a bit unmerciful, but have pity: I began editing with 2700 pictures! And that doesn't even count the ones my spouse took. . . What a trip! I'm really enjoying your holiday - thank you so much! My dad used to cultivate cactus just like those, and if I can find his cactus book I'll look them up. That would be great! They were soooo fluffy-looking. . . but we are old desert hands and knew better! Thanks! That was really a trip of a lifetime, or nearly. Certainly something I expect we will all remember for the rest of our lives. Very nice. sorry I might miss next week's addition, unless it is posted by Friday. I will be sure to watch for it! The posts never go away, so you can catch up when you get home. And I might miss the following week, if I don't get moving! Yay! I found my way here to the next installment. I don't hear anyone complaining about the quantity or quality of the photos...so keep 'em coming please. 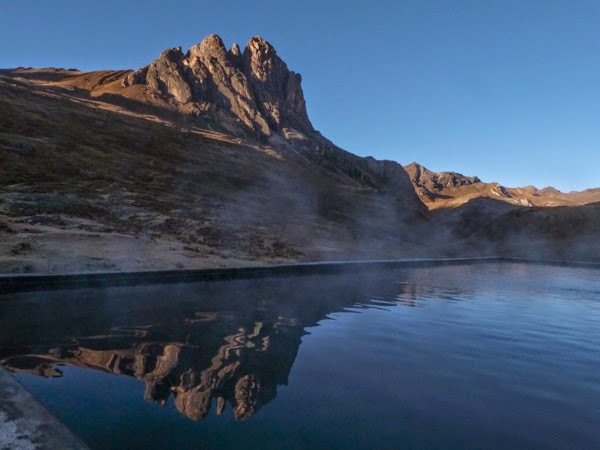 A hot spring above 15,000 feet must be a rare pleasure indeed. And you don't cross the headwaters of the Amazon everyday either. Amazing! 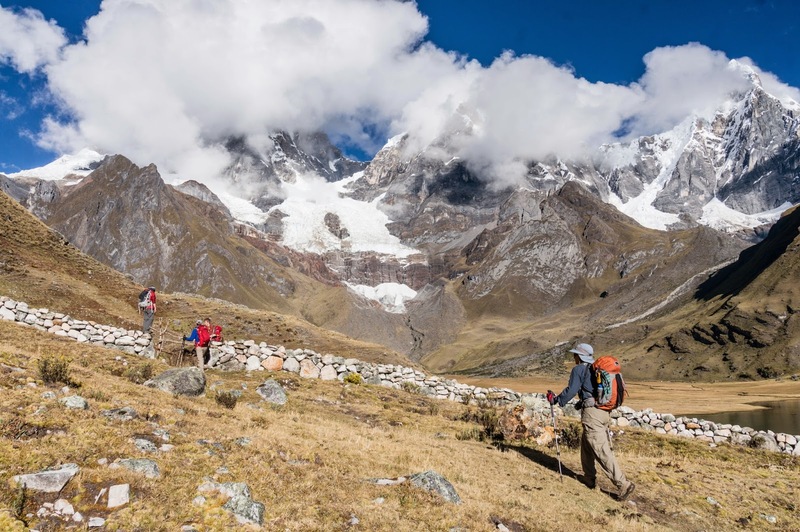 Did you find your way to the Cordillera Blanca too? I just discovered I had a couple of bad links in the "Photos" page above. Special price for Death By Ice Cream!